History: Hoffman and Marshal met each other early in life, and immediately started a healthy rivalry, which just continued to escalate. At some point, they started up the militant terrorist group, The Brotherhood. 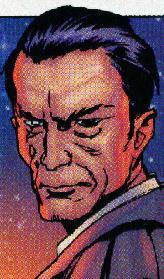 After Marshal left due to Hoffman becoming a little power-hungry, he became a government agent set on taking down Hoffman. (The Brotherhood#2)- At Barksdale Air Force Base, Marshal waited to talk to a survivor of a recent Brotherhood strike. Before he could converse, the base was blown up by something. Surveying the damage, he said the hunt for X was now out of the army's hands and in his. (The Brotherhood#5)- Marshal showed up and offered Malcolm Reeves his services in finding his daughter, Malon, who was kidnapped by the Brotherhood's London Cell. Later, he found Brotherhood member Bela prowling the Reeves estate, and quickly took care of him. While interrogating/torturing Bela, some other agents found another Brotherhood member, Fiona, who was with Bela. Marshal decided there was always room for more. (The Brotherhood#6)- At Malcolm Reeves' office, Reeves and Marshal had a little discussion about keeping secrets. He later entered a dark room, where Bela was tied to a chair. After taunting him some more, he told him that all that he wanted was "X". After the fight between Malcolm Reeves and Bryson Bale, Marshal, who was watching the whole time, told Malon Reeves that she was going to get a chance to make things right, and all she had to do was help him find X. (The Brotherhood#7)- In an unnamed prison, Marshal had the surviving members of the London Cell of the Brotherhood watch the riot that Marshal caused. He then offered them a way out, but they had to help him take down X to get it. (The Brotherhood#8)- After Hoffman gave the London Cellers a mission to kill a government informant, Marshal gave them a stunt body as a fill-in. When things didn't go quite as planned and the informant wound up being a she instead of a he, Marshal played problem solver with a pocket knife and the informant's hand. (The Brotherhood#9)- At the X-Force parade, Marshal walked the street noting the Brotherhood members in the crowd, he didn't notice Ms. Fingers though, as she grabbed him from behind. Hoffman scoffed at Marshal, as Brotherhood members dropped left and right to X-Force. As Mike Asher dropped from the sky, Hoffman scoffed that the last Judas was gone, but Marshal said he was a fool if he thought that, as Orwell cracked a brick over Ms. Fingers' head. Marshal told Hoffman his plan to become X, the leader of the Brotherhood, but Hoffman fired a blast at him which inadvertantly hit Orwell. While Hoffman and Marshal came to blows, they didn't notice a stream of Mike Asher's blood streaming to them until it was too late. While looking over their remains, U-Go Girl wondered aloud if this was "The end of a revolution?" To quote Marshal, when asked about which government he works for... "Let's just say I like to keep my options open". There was much speculation who writer X was when the book first started, but it showed to be pretty smart that he didn't reveal his secret. According to Prime Eternal: The popular theory was Devin Grayson.